Have you ever wanted to travel back in time? Or escape as far as possible from everyday life and try to be a true hedonist for a few days? Well now is your chance! Come and visit Krk and be a part of Lovrečeva Krk Fair. Since the time of Liburnia , through Antic times, Middle Ages and Modern Age, right to this day, this area has been a meeting point of numerous nations, indigenous inhabitants and different cultures. So back in 1524, slowly but surely, Krk became the gathering centre of many European, as well as world traders. The inhabitants of Krk have recognised their own value and since then a traditional three-day Lovrečeva Krk Fair is being held once a year. What makes Krk Fair so special? 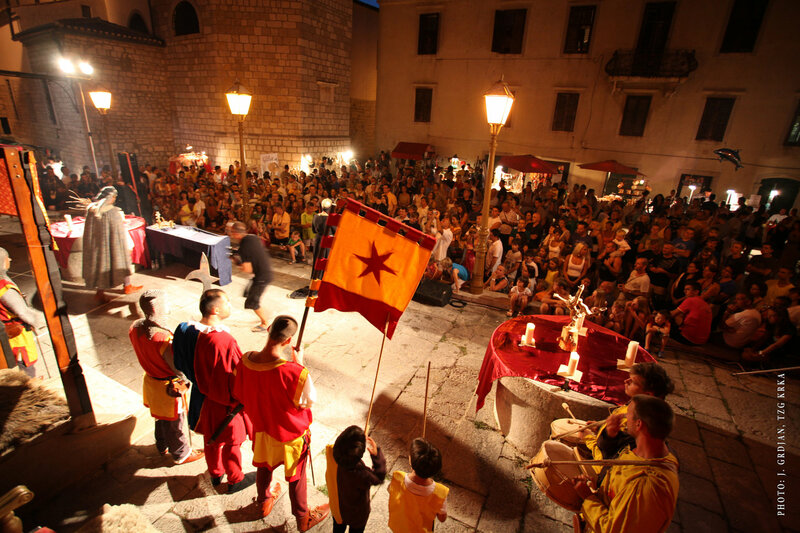 Medieval Lovrečeva Krk Fair is the longest-lasting traditional event in the whole northern Adriatic. Nowadays Krk Fair is organised by City of Krk Tourist Board and City of Krk together with partners and various associations. There are many festivals organised to revive the history, but it is not the case here. Krk Fair unites fair tradition and unavoidable gastronomic offer with historical elements and a number of traditional, cultural and other entertainment programs. This year the Krk Fair will be held on 5 different stages in Krk – Kamplin Square, Vela Placa Square, Krk waterfront, Main Pier and Vinjole. On Kamplin Square you will go back to the Middle Ages and meet knights of Krk, archers, traders, entertainers, jesters and, if you´re lucky, you can even meet the duke Frankopan himself. Program on the Vela Placa Square has been prepared by art societies from the town of Krk, Kornić, Vrh and Poljica. Numerous performers will be in charge for the good mood on the Krk waterfront, whilst the night of St. Lawrence will surely not pass without music fireworks at midnight. After the fireworks you can enjoy in the concert of Parni Valjak. At Main Pier you can expect evening entertainment till early morning hours. Who says that Middle Ages and electro music don`t go together? Come to Vinjole Square on Wednesday and join the party. Once again, we invite you to visit Lovrečeva Krk Fair. Stay with us at Hotels Krk and feel the magic of Krk town and Lovrečeva Krk Fair, a time of year when the past meets the present.